If I have one go-to technique for grilling and smoking fish, it is to use a cedar plank. The plank supports the delicate fish as it cooks and doubles as a serving platter. It is a combination of rustic and chic that looks good and tastes good — but ultimately is very practical. The beauty of this preparation is that you can make it on a grill, in a smoker or even in the oven (set inside a sheet pan). The plank removes the obstacles that people face when grilling fish. It won’t stick to the cooking grate, it won’t fall apart and you don’t have to use that awkward fish basket. The most common fish to cook on a plank is salmon, but this technique works for all filets of fish. I prefer to grill fish steaks and shellfish directly on the grill. If you have never used a cedar plank, you can buy them at the grocery store or online. They are not expensive and although some people clean and re-use them, I like to clean them and save them for firewood or for adding to a charcoal fire. It’s pretty difficult to fully remove the cooking smells from the first cook and it’s not worth saving a few cents and compromising your fresh fish. Once you have your plank and your fish, it is so simple to prepare that you hardly need a recipe. You brush the fish with olive oil and season it lightly with salt. Next you layer thin slices of lemon over the fish like shingles on a roof. I love cooking fish with a layer of lemon slices on the top because it protects the top of the fish and keeps it tender. It also gently scents the fish with lemon and you have your lemon slice hot and ready to squeeze over your portion of fish. Grilling on a cedar plank is an old Native American cooking technique that is finding its way to backyards all across America. You can purchase packaged planks at gourmet cooking stores or rough it and have a lumberyard cut the planks for you. They are exactly the same, just make sure you use untreated cedar wood. Try this recipe with center-cut pieces of wild salmon. If wild salmon is not available, farm-raised salmon will work as well. Ask your fish monger to stock the wild salmon – it may be a little more expensive, but it is worth every penny. Remove the plank from the water and place fillet skin side down on wood. Brush with olive oil and season with salt. Cover top with lemon slices. Place planked salmon in center of the cooking grate, plank side down. 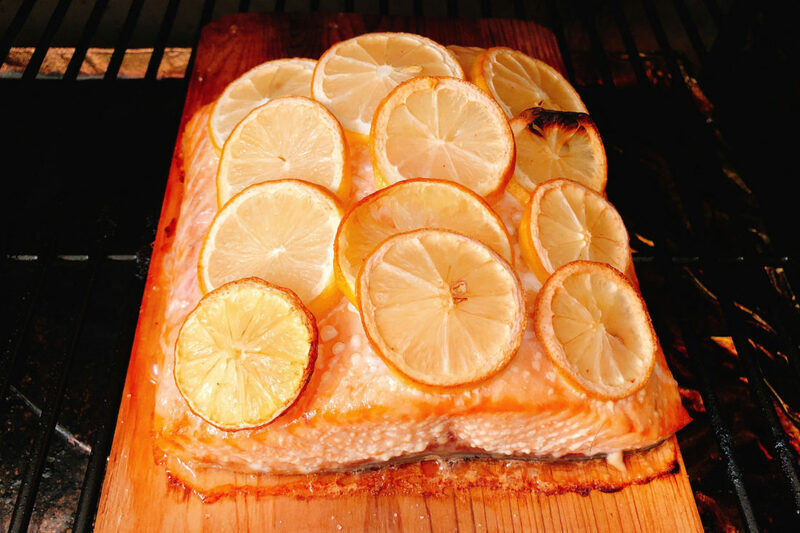 Grill for 20-30 minutes or until salmon is pink in the center and flakes easily with a fork. Remove from grill. Serve the salmon directly from the plank. This cucumber salad is refreshing and crunchy in the heat of the summer when cucumbers practically fall from the sky. I usually make a batch and keep it for a few days in the fridge, pairing it with all manner of fish. Wash and dry cucumbers, remove ends. Using a vegetable peeler, peel the length of the cucumber in a striped pattern so there are 1/2 inch strips of skin left on the cucumber. (Note: the cucumber will have candy-cane strips when finished.) Cut the cucumber in half lengthwise and slice cucumbers in chunks about 1/4 of an inch wide. Add onion and set aside. Meanwhile, make dressing by combining sour cream, yogurt, vinegar and sugar in a large bowl. Stir in dill, capers, salt, pepper and granulated garlic. Taste and correct seasonings by adding fine-grain sea salt and white pepper if necessary. Fold cucumbers and onions into dressing until well combined and all the vegetables are coated with the dressing. Refrigerate until ready to serve, up to 4 hours. Just before serving, stir and taste, adjusting salt and pepper if necessary. Nutrition information per serving of salmon: 242 calories; 97 calories from fat; 11 g fat (2 g saturated; 0 g trans fats); 94 mg cholesterol; 452 mg sodium; 0 g carbohydrate; 0 g fiber; 0 g sugar; 34 g protein. Nutrition information per serving of cucumber salad: 75 calories; 43 calories from fat; 5 g fat (3 g saturated; 0 g trans fats); 12 mg cholesterol; 281 mg sodium; 7 g carbohydrate; 2 g fiber; 4 g sugar; 2 g protein.